The humble burger has become big news in Bristol in recent years, with the likes of The Burger Joint and Warren’s Gourmet Burger Company proving popular with the public. 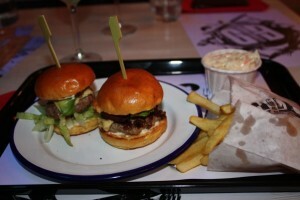 The inclusion of a “Best Burger” award in the 2012 Bristol Good Food Awards cements the burger’s reputation yet further – it’s no longer just a cheap and cheerful fast food option. 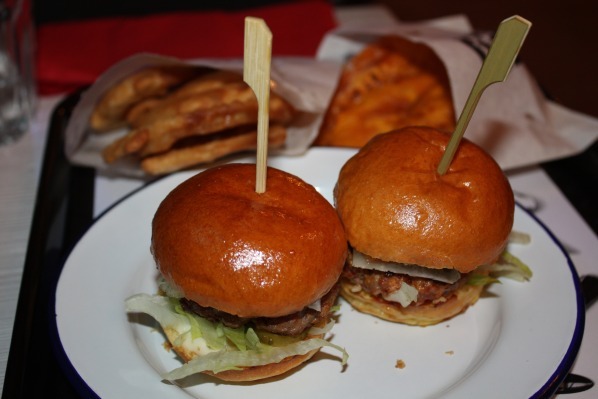 It goes without saying that we were excited to learn of new burger pop up Guerrilla Burger, specialising in sliders (mini burgers) and hosting their first event at 40 Alfred Place on Friday, September 14th. After a quick pint in The Green Man, we headed to the venue, decked out in Guerrilla Burger branding with an awesome backlit sign in the window. 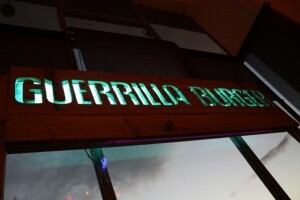 We’d already had a chance to peruse the menu via Guerrilla’s Facebook page, and were very excited! Our evening was priced at a set cost for one cocktail, a starter, one burger option, two sides, dessert plus tea or coffee – but this pricing has now changed to a “price per item” menu based on feedback on the night. We started off with a cocktail each: a Guerrilla Mule for me, a Frozen Strawberry Daiquiri for the boyfriend. I’m a bit of a ginger addict, and the Mule fulfilled this addiction perfectly – a refreshing cocktail but with a nice ginger kick. 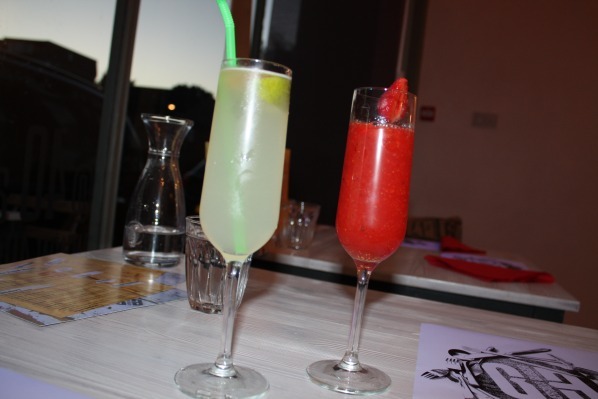 It was good to see the daiquiri full of chunks of strawberry flesh too – these cocktails slipped down far too easily! With a write up for Bites in mind, we ordered two of the three starters on the menu and shared (I’ll have to try the coconut prawns next time!) I was intrigued to try their take on arancini, traditional Italian balls of cooked rice, stuffed with various fillings and deep fried. Ant of Guerrilla Burger explained to us that his father is Sicilian and so he knows arancini well, but that this was his own take on the dish. 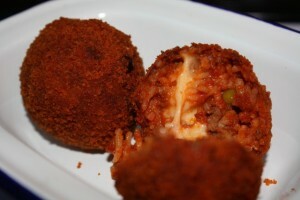 These arancini were really rich, stuffed with melted mozzarella and ragu, and with a lovely crunch to the crust. Delicious. To feed our cheese addiction yet further, we also ordered the Crispy Cheesy Mushroom Bombs: three button mushrooms, individually encased in a herby cream cheese and sealed with a filo pastry crust. 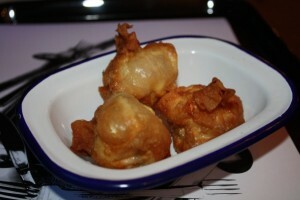 They may not be much to look at, but were a delicious take on the stuffed mushroom starter that we all know and love. Starters cleared (all dishes are served on plastic trays with a Guerrilla-branded paper liner), it was time to sample the burgers themselves. It was a shame that the Spicy Tuna option was off the menu on the night (it’s now been replaced by a Panko Chicken option), but we decided to share two of the other choices. The Double Danish Blue promised local blue cheese, crispy bacon, avocado, lettuce and gherkins with my beefburger, and I wasn’t disappointed. The brioche buns were beautifully glazed on top, the beef succulent, the toppings tasty and perfectly adequately sized for the portion. Definitely no complaints about the sides of coleslaw and fries either. Each portion consists of two sliders, meaning it was eay enough to hand one of mine to the boyfriend in return for a taste of his Spanish order. Being fans of chorizo, it as no surprise that we went for this choice – and it’s the first time I’ve experienced the chorizo actually being mixed in with the burger itself, giving a lovely smokey taste. The saltiness of the Manchego cheese was the perfect foil for the sweetness of the quince jelly too – delicious! He chose two different sides – the onion rings and the sweet potato crisps – and while the onion rings were among the best I’ve had for a long time, the sweet potato crisps were disappointingly flaccid. Still tasted good, though. Onto dessert, and a sour cherry frozen yoghurt, a portion of pistachio ice cream for him. 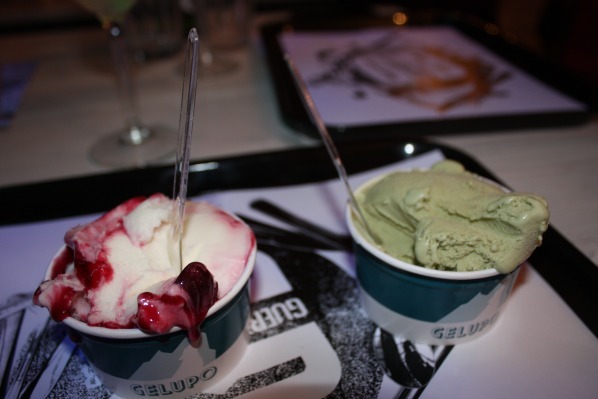 The perfect end to a brilliant meal! The next Guerrilla Burger pop up takes place on Friday, September 21st, and spaces are filling fast. To book, call the Guerrilla Hotline on 07803 121311. For more details, visit their Facebook page, or follow them on Twitter. Please note that we were charged a special friends and family rate on the night, but this in no way impacted on our opinion. Must admit I was somewhat overwhelmed by guerilla burger – there was a group of 8 of us and whilst we all enjoyed the food the service was very poor and spoilt the occasion! One of our group had been the week before and had similar poor service but put this down to teething problems! Our conclusion is it is not teething problems but unfortunately their front of house team is letting down the chefs in the back who made some lovely food! We had to get menus for ourself from the bar, chase waiters for drinks and approach them to make food orders! The food is also a little more expensive then it warrants which with good service I would not mind but given the service we received it is worth noting! Only the second time I have failed to leave a tip due to such poor service and as a new restaurant I would be interested in feedback but there response was ok – they clearly do not care – I can only assume they have no stake in the business and if I was the owner I would be looking to get some staff with customer service skills and a little bit of drive and enthusiasm to take things forward.